Hold your feet and gently use your leg muscles to move your feet towards the ground. Keeping a straight back and bringing your feet closer to your body intensifies the stretch. Keep the back leg straight and push the back heel into the ground. Keeping a straight upper body and gently lifting your hips helps. There should not be much pressure on the front foot. Stand closer to the wall and bend one leg, keeping the foot flat on the floor. You should feel a stretch in your lower calf. 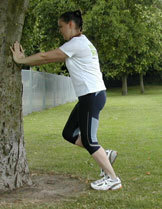 Leaning towards the wall intensifies the stretch;there should be little pressure on the other foot. Place one foot around the other with both feet flat on the ground. Keeping both legs straight, lean your hip towards the side of your rearmost foot (so if your right foot is rearmost, lean your hips to the right). You should feel the stretch down the outside of your leg and around your hip — if you are very stiff, it may take a few times before you feel anything.